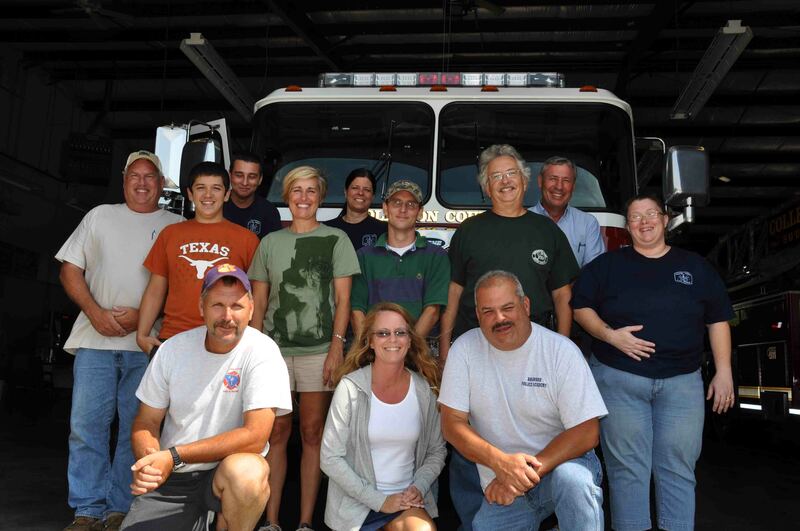 Twelve Colleton County Volunteer Firefighters have successfully completed the revised Medical First Responder Course. This 65 hour training class was based on the National Registry Curriculum and lasted through most of the month of August. Following the training, the students took a 100 question written exam from a test bank and were tested on their skills during practical evaluations. Click here for additional information. 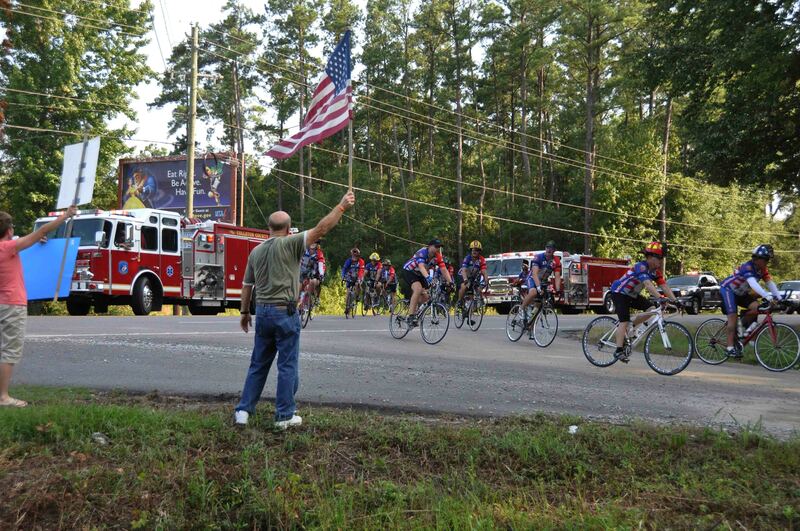 The 2011 Brotherhood Ride visited Colleton County this weekend, arriving at the Elks Lodge off of Jefferies Highway Saturday evening, resting overnight and continuing on to Charleston Sunday morning. The 30+ riders are almost half way through a nearly month long trek, beginning in Fort Meyers FL and ending in New York City. The ride this year is dedicated to the 411 responders who lost their lives on 9/11/01...click here for more information. A two vehicle accident has left two women in critical condition and sent two others to the hospital. 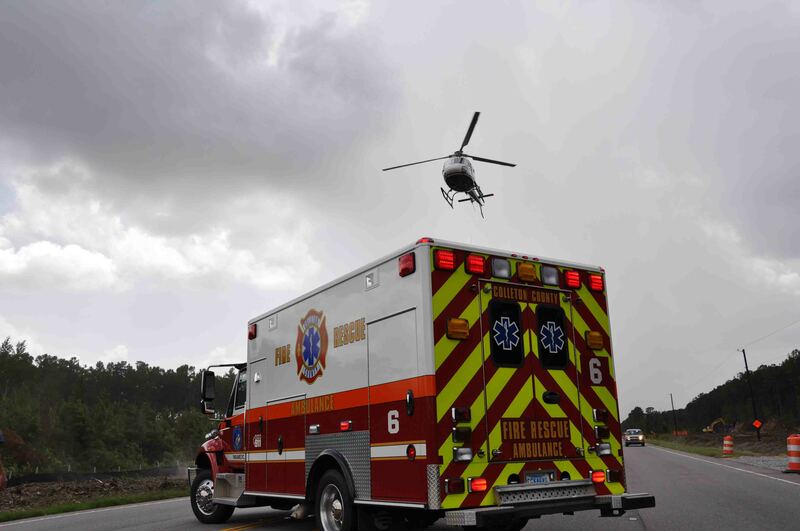 The accident occurred on Broxton Bridge Highway (US Hwy 601) at the Colleton and Hampton County lines on Saturday morning 27-August at 03:25. The area is a remote rural area near where Colleton, Hampton, Allendale and Bamberg Counties meet. Lt. Campbell in Car 118 arrived at the scene a few minutes after the dispatch...click here for additional information. A fire, which originated in the bathroom, has displaced a Francis Street family Friday evening 26-August. 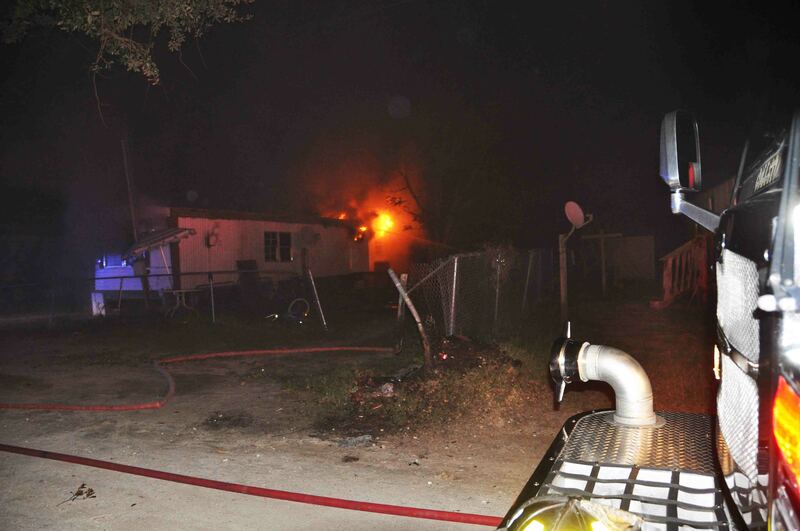 9-1-1 Operators were notified of the fire in the singlewide mobile at 22:36. Engine 19 arrived minutes later to find moderate smoke conditions with flames visible from the rear door and window. Firefighters deployed one 1-3/4 handline to the back of the residence... click here for additional information. A head-on collision resulted in four people being injured, one critically, Thursday afternoon 25-August at 13:09. A full-sized Dodge Pickup truck, towing a small trailer collided with a Hyunda Elantra on ACE Basin Parkway (US Highway 17) at the intersection of Hickory Hill Road. 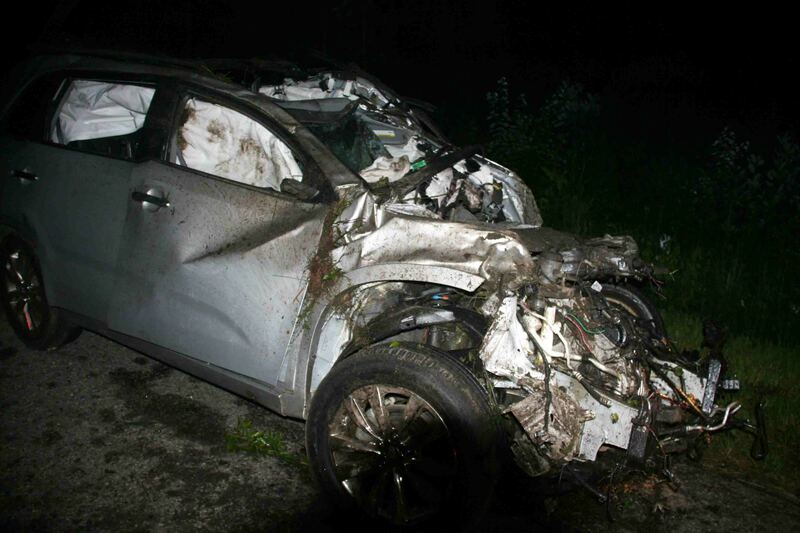 The driver of the Elantra received critical injuries and was trapped in the wreckage. Click here for additional information. The Visitation for Mary Simmons, Capt Sam Pinckney’s mother, will be held Friday August 26 at Koger Funeral on South Jefferies Blvd from 12:00 to 17:00 and then at Aimwell Presbyterian Church on Charleston Highway in Neyles from 18:00 to 20:00. The funeral will be held at Aimwell Church Saturday 27-August at 13:00. Please remember their family in your prayers. A high speed single car MVC in the 3500 block of McLeod Road resulted in the ejection of the teenaged driver. The small KIA Sorento left the roadway and struck a tree. The passenger was wearing a seatbelt and suffered only minor injuries. The driver was ejected into the ditch, receiving a suspected head injury. 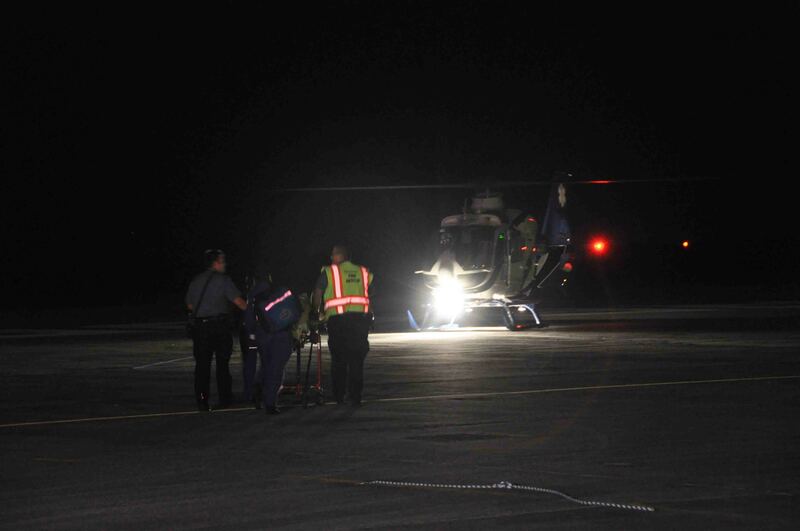 He advised he was unconscious for a short period following the crash. Click here for more information. We offer condolences to Firefighter-Paramedic Bryan Eadon and his family. Bryan’s grandmother, Mrs. Adele Fralix, passed away Sunday, August 21, 2011 after an extended illness. She was 79. Visitation will be held at Bryant Funeral Home in St. George Monday evening from 18:00 to 20:00. Funeral services will be held at 11:00 Tuesday at Memorial Baptist Church in St. George. The burial will follow at St. George Memorial Gardens Cemetery. We offer condolences to Station # 12 Captain Sam Pinckney and his family. Captain Pinckney’s mother passed this morning 22-August after a short illness. She was 94. We will provide information regarding arrangements as soon as we receive them. We would like to congratulate Firefighter-Paramedic Dominic Socie on successfully passing his National Registry Paramedic Examination. 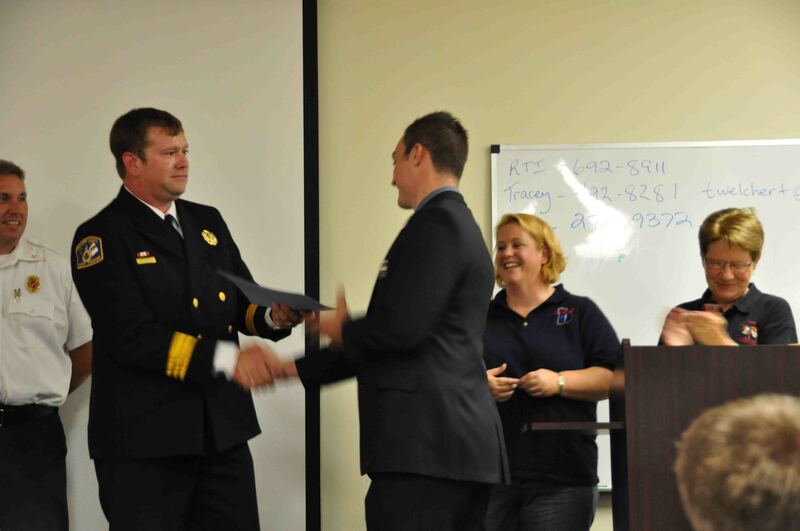 Socie recently completed the Paramedic Training Program at rescue Training in Savannah, Ga. He graduated top in the class. We offer condolences to Fire Commission Vice-Chairman SG (Scooter) Drew and his family on the death of his father SG Drew Sr. Mr. Drew passed away today at Colleton Medical Center. Visitation will be held at Parker-Rhoden Funeral Home Sunday 21-August, at 3 PM, with the funeral service following in the Chapel at 4 PM. Mr. Drew will be buried at the Stokes Cemetery in Hendersonville. Please remember their family in your prayers. 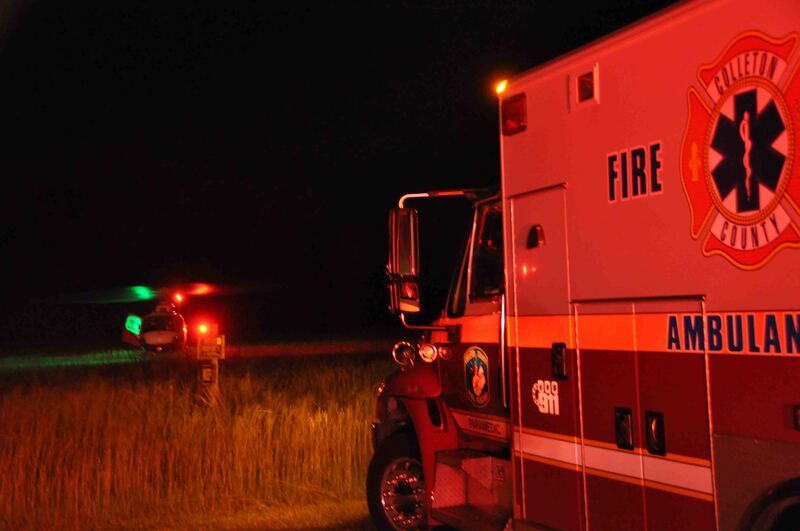 A single vehicle accident has left one man in critical condition and injured three others. The accident occurred in the 2800 block of Cottageville Highway (US Hwy 17-A) north of Phillips Road at 22:43, Monday evening 15-August. A southbound Ford Pickup truck, pulling a trailer lost control in a curve, over-corrected and went off of the right hand shoulder. Click here for additional information. Congratulations to Firefighter/Paramedics Jimmy Guenther and Chris Jones for successfully completing Engineer testing. This process requires completing a multitude of pre-requisite courses followed by a comprehensive examination process. They have both been promoted to the rank of Engineer/Paramedic. We wish to congratulate Firefighter-EMT Dale Kizer and his wife CMC ED Charge Nurse Samantha on the birth of their son, Evan Reese. Evan was born yesterday morning. He weighed 9 lbs and 2 oz. Both Sam and Evan are doing fine. Two Colleton County Firefighters completed the Paramedic Program at Rescue Training in Savannah, GA, Wednesday 3-August. The ceremony was held at the Rescue Training facility on Mall Terrace in Savannah. Nineteen students completed the course and received certificates. They will test for their National Registry in two weeks, which is the final step before receiving their Paramedic Certification. Click here for more information.